Ideal for pesco-vegetarians, ProOmega® in fish gelatin soft gels is a double strength EPA+DHA formula for more omega-3 benefits in fewer servings. 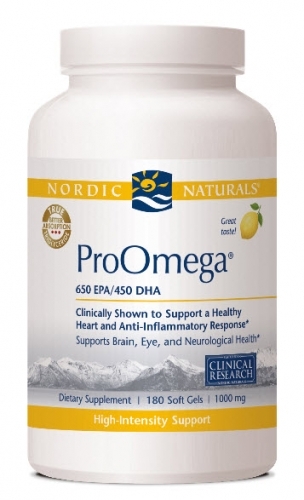 For high intensity, therapeutic support for both body and mind, ProOmega is an excellent choice, containing 1100 mg EPA+DHA per serving. Two fish gels daily, with food, or as directed by your health care professional or pharmacist. For intense support, take two soft gels with food twice daily.